Note: Join the Russian-speaking Dart community at Telegram , Slack and Google+ . And at the end of the article you are waiting for a small announcement. Today we announce the release of a stable version of the Dart-2.0 programming language, as well as the Dart web platform, which offers a unique combination of productivity, performance and scalability. With the release of Dart ? web developers can also use this version of the language, all libraries and tools will receive a number of improvements specific to the Web. All the necessary information on installing and creating the first application can be found here . Dart 2 is an important milestone on the path to the revival of Dart as a popular programming language, focused on the rapid and convenient development of mobile and web applications. We want developers who create client applications to be productive: with a language, framework, and components that reduce the template code and allow them to focus on business logic, and tools that identify errors early on, help with debugging and generate a compact and fast code. For Google Dart is one of the few languages ​​that we use to develop web applications with millions of lines of code from a variety of different projects, including Google Ads, Google Shopping and our own projects for the internal infrastructure. In fact, you could already use Dart without realizing it: the popular preprocessor of styles Sass was recently rewritten to Dart to make it faster, more portable and easier to develop. Sass is now distributed as a standalone executable on Homebrew and Chocolatey and compiled for jаvascript on npm. Dart makes it easy to install applications anywhere, without external dependencies, and for deploying workflows both for users who write to Dart and for users who do not. Dart 2 focuses on three aspects: told in February ( ? Russian version of ) Dart type system is this page. As mentioned in previous posts in the blog, Dart 2 also reduces language noise in several key areas: for example, the keyword [i] new now is optional, and the keyword is const optionally in AngularDart 5 , supplied as part of Dart ? uses the advantages of new assembly system (described below) so that the user can use faster incremental builds at design time and more compact compiled jаvascript. One of the main directions in this version was the reduction in the amount of code that is processed when the page loads, which greatly reduces the "time to interactivity" for web pages. 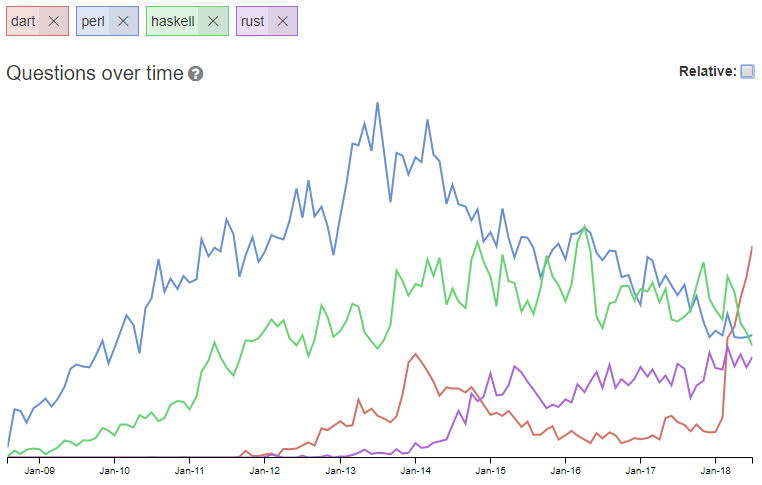 In many applications, the code size has decreased by more than half compared to AngularDart 4. To demonstrate the improvements in Dart's web platform, we created client implementation based on Dart for the site HackerNews as a progressive web application; it is published along with other examples on the popular site HNPWA . Using best practices to create web applications on Dart, we were able to create a full-featured application that is fully interactive in one second on modern devices and up to five seconds on a modest mobile device in a slow 3G network. This is competitive even when compared with lightweight Web frameworks optimized for small applications. Our investment in infrastructure also extends to our library of components , which we also updated. Now you have access to 100 new classes, including various Material components . You can study all our components in gallery of components . Together with Dart ? Dart becomes a first-class compiled-in-jаvascript language, with a development cycle that web developers expect, and excellent performance characteristics at runtime. This is achieved thanks to the advantages that most languages, oriented to JS, do not provide: dartdevc , provides fast incremental compilation when generating jаvascript, which is easily read and debugged. This allows our compiler dart2js focus on creating highly optimized jаvascript for advanced web applications for mobile and complex enterprise desktop applications. Both compilers use the explicit Dart type system to optimize their output. Our web tools are based on new assembly system , created in order to be fast, debugged and extensible. Now tasks such as generating code for serialization, compiling Sass in CSS, and compiling Dart in jаvascript, occur in the same tool chain, which supports quick, incremental updates as parts of your application change. The build system is also designed to support use outside the Web. Example: it is used by Flutter developers to generate code for serialization in JSON . Together with Dart 2 we have an expanded set of tools for developers. In addition to support Android Studio and JetBrains tools, including IntelliJ IDEA and WebStorm , we also support Visual Studio Code with the extension Dart Code . And we also have a platform for experiments: DartPad , which was completely updated for Dart 2. Finally, the Dart SDK comes with a set of other useful tools: the package manager, which works with our site , static analyzer , linter, which you can use from the command line or as a package, as well as the toolkit for Web documentation and Formatting , corresponding to standards of the language Dart . Read the instructions for getting started with Flutter and the set tools Web Dart . In see notes the release contains detailed technical information on many other minor improvements made after Dart ? some of which are critical. If you are experiencing problems that Google search can not solve, we recommend starting with StackOverflow . Subscribe to our newsletter Dart Announcements and follow us at Twitter to receive updates. We would also like to see you in our communities, for example, at Gitter and redirect r /dartlang . Dart has become a general-purpose language, which is optimized for development on the Web and on mobile devices. We have been working on Dart 2 for several years already, during this time it affected all aspects of our ecosystem and required the migration of millions of lines of code and hundreds of packages. We are grateful to the communities Dart and Flutter , as well as hundreds of Google engineers who helped us on this journey. We could not have done this without you! I would like to congratulate the team of Dart developers on such an important event, this is indeed a major milestone for the development of the language. Of course, many of the words in this article may seem to you quite discussion , you can discuss them both in the comments and in our chat rooms Telegram , Slack and Google+ . And the promised announcement: in addition to small Mitapov, we hold annual big events devoted to language, tools, Flutter, AngularDart and everything connected with them. Last year we had visiting engineers from Google, we cooked a special beer , and in general it was fun. This year we will try to do even better! So book the end of November - early December, and watch the announcements. 30/07/2018 WebAssembly is the return of Java applets and Flash? 14/07/2018 Flutter.io to bury or burn? 31/03/2018 Fluttering * bicycles. What should I do when I save the state to Flutter?